The Freedom From Religion Foundation has strong reservations about an appeals court nominee's fitness for the judgeship. 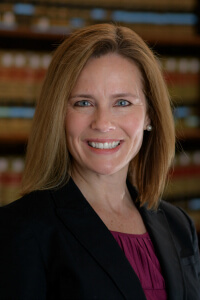 In a number of questions it proposes to Senate Judiciary Committee Chair Chuck Grassley, FFRF expresses its concerns about Notre Dame law professor Amy Coney Barrett, whom President Trump has nominated for the 7th U.S. Circuit Court of Appeals. The 7th Circuit handles appeals from Illinois, Indiana and Wisconsin, FFRF's home state of operation. In its questions, FFRF focuses on public stances Barrett has taken that place her at odds with the secular nature of the U.S. Constitution. Barrett has repeatedly expressed the view that her Catholic faith may trump her secular duties as a judge. For instance, Barrett has stated her disagreement with Supreme Court Justice William Brennan's comments during his 1957 confirmation hearings that the Constitution takes precedence when in conflict with personal religious beliefs. Barrett has criticized this exemplary stance, writing that she does "not defend this position as the proper response for a Catholic judge to take with respect to abortion or the death penalty." In 2015, Barrett signed a letter from "Catholic women" to the "Synod Fathers in Christ," in which she expressed her "fidelity to and gratitude for the doctrines of the Catholic Church." The letter expressed her views on a number of topics that will surely come before the 7th Circuit: "We give witness that the Church's teachings — on the dignity of the human person and the value of human life from conception to natural death; on the meaning of human sexuality, the significance of sexual difference and the complementarity of men and women; on openness to life and the gift of motherhood; and on marriage and family founded on the indissoluble commitment of a man and a woman — provide a sure guide to the Christian life, promote women's flourishing, and serve to protect the poor and most vulnerable among us." Barrett's views on such debated notions as the constitutional wall of separation between church and "religious liberty" are likely to be problematic, as well. In fact, she has already expressed some approval of the latter notion, which in practice means the license to discriminate based in religion. FFRF has pointed questions for Barrett on these and related topics. It also asks her view of the 2014 Supreme Court 2014 decision in Burwell v. Hobby Lobby establishing for the first time that within the meaning of the Religious Freedom Restoration Act, a "person" includes a for-profit corporation. "Barrett's record and stated positions will clearly affect the concerns of the growing number of Americans who identify as secular or nonreligious, today approaching nearly a quarter of the population," FFRF Co-Presidents Dan Barker and Annie Laurie Gaylor state in their letter. Almost one-fourth of Americans now identify as nonreligious. That 8-point increase since 2007 and 15-point jump since 1990 makes the "Nones" the fastest growing identification in America. Nationally, about 35 percent of Millennials are nonreligious. FFRF does not advocate for a religious test for public office. Its objection is not to Barrett's Catholicism, but to her expressed unwillingness to side with our Constitution when it conflicts with her personal religious beliefs. Giving Barrett's judicial outlook, a place on the 7th Circuit could have far-reaching impacts on important issues such as a woman's right to choose, the right to die, the death penalty, and the collision of Catholic health care and our secular law. If Barrett truly believes her Catholic dogma dictates her behavior, she should recuse herself in cases involving not only abortion and the death penalty, but on all other issues her religion demands, including gay marriage, transgender rights, euthanasia, and the furtherance of her church's evangelical mission. Better yet, let's put someone on the bench who can approach all cases with a clear head and unmuddled conscience. The Freedom From Religion Foundation is a nationwide nonprofit organization representing more than 29,000 members across the country, including members in every state. Its purposes are to protect the constitutional principle of separation between religion and government, and to educate the public about nontheism.